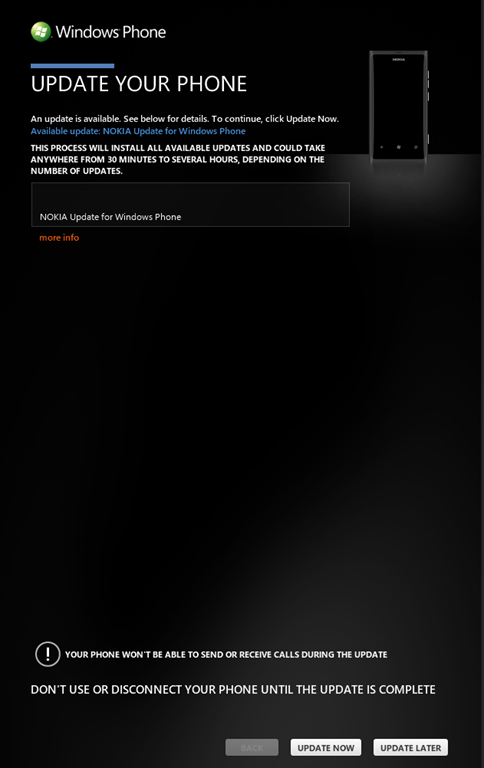 I woke up this morning to find that my shiny new Windows Phone 7, the Nokia Lumia 800, was telling me that I had a new update. As some of you will know, I REALLY like the Nokia Lumia 800, it is a great piece of hardware, but it has one killer feature missing, in my opinion. This is the ability to tether the phone to my laptop using “Internet Sharing” as I could on my HTC HD7. I have heard from both parties in this problem, i.e. Nokia and my mobile phone provider, and both say that it “should” work, but alas, it doesn’t. I was sort of hoping that this new update would bring with it the ability to tether, but alas, it didn’t. Details of what is included in this particular update can be found here.